1920s Paris is my ultimate fantasy destination. Ever since I read Among the Bohemians by Virginia Nicholson, I have been fascinated (read: obsessed) with it. Nicholson’s book explores the lives of bohemian, artistic London from 1900 to WWII – not their work, but how they dressed, where they lived, what they ate, how they created lives as artists, rebels, and thrill-seekers. As a publisher, as a reader, as a woman, I have to admit that I have completely lost my heart to a fictional character named Kiki Button. 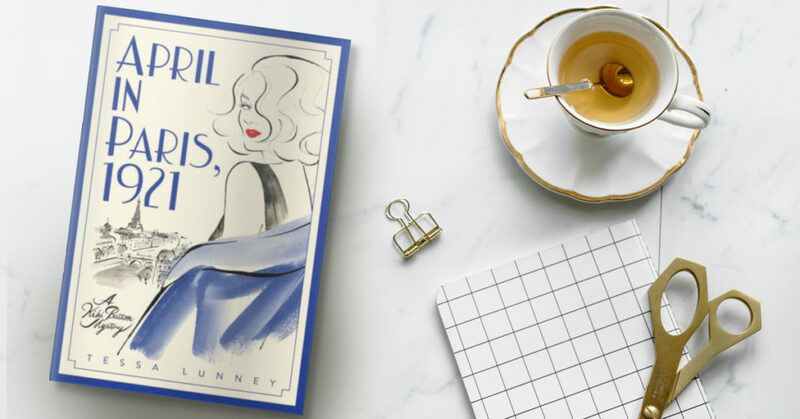 She is the protagonist of April in Paris, 1921, a gorgeously written, clever, very appealing and witty mystery – think Nancy Mitford meets Alexander McCall Smith, with a dash of the Divine Miss Fisher. The story takes place in 1921. After two years at home in Australia, Katherine King Button has had enough. Her rich parents have ordered her to get married, but after serving as a nurse during the Great War, she has vowed never to take orders again. She flees her parents and the prison of their expectations for the place of friendship and freedom: Europe – where she remakes herself as Kiki Button, gossip columnist extraordinaire, partying with the rich and famous, the bohemian and strange. But while on Picasso’s modelling dais, he gives her a job: to find his wife’s portrait, which has gone mysteriously missing. Kiki accepts her commission, but that same night, Fox, her old spymaster from the war contacts her. She has to find a double agent or face jail. Kiki left Europe to leave him behind, his cruelty and charm, his cold manipulation. All the deliciousness of Paris in springtime cannot remove the long shadow of her past actions. 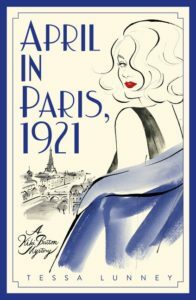 Through parties, whisky and informants, Kiki has to use her knowledge of Paris from the Great War to connect the clues over the course of one week. and skulduggery galore. But the real charm of this novel is of course the entirely original Kiki: her fabulous clothes, her gaiety, her secret sadness, her appetite for life, her many and complicated loves… She’s the kind of character where you know underneath that fabulous, slightly unwashed dress she’s wearing, her stockings might be torn and her knees might be bruised, but she’ll always be laughing, tossing her hair back and cadging a cigarette off someone. She’s an original, the real deal. I adore her. 1920s Paris is my ultimate fantasy destination. Ever since I read Among the Bohemians by Virginia Nicholson, I have been fascinated (read: obsessed) with it. Nicholson’s book explores the lives of bohemian, artistic London from 1900 to WWII – not their work, but how they dressed, where they lived, what they ate, how they created lives as artists, rebels, and thrill-seekers. As Virginia Woolf’s grand-niece, she is well placed to know! 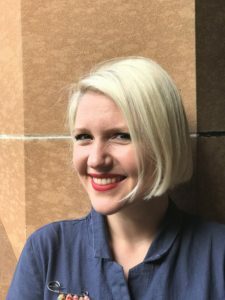 Her book came at a time when I was struggling with how to make a writing life, and was searching for a guide, a template, examples from the past. The book changed my life. relations, especially in Britain; a desperate need to throw out the old order and make it new. Much of this work had begun before the war, of course, but it increased afterwards with the fast pace of the industrial age. It also let me explore many of my other areas of interest: the position of women in politics and society; twentieth century history, in particular the interwar period; modernism and its effect on mainstream culture; the intersection of fashion and politics; how to be an artist; how to be a modern woman. A tall order for one book, perhaps, but the 1920s was a radical time. Tey books but they were becoming too dark to read with an infant in my arms. I wanted more of the bright wit of Nancy Mitford (I’d read all her books too), a book that took me away to another world, another life … so I decided to combine everything I wanted and Kiki was the result. Playful, charming, witty and very, very entertaining, Kiki Button – the fearless, beautiful and blonde-bobbed Australienne – is a heroine to win hearts. This entry was posted in Catherine Milne, Guest Post, Recommendations and tagged April in Paris 1021, bohemian, Catherine Milne, Kiki Button, Tessa Lunney, Virginia Nicholson. Bookmark the permalink. "Meet Kiki Button: socialite, private detective and spy"